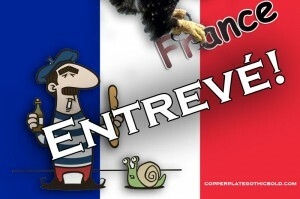 It’s a known fact that if the French had their way they would use comic sans as their national font. Don’t ask us why, it doesn’t make a single lick of sense. It must be for their lack of work ethic, unions, game playing or pension for protesting that they feel that such a font would embody their concept of nationality. It won’t happen on our watch! In fact we have an artists rendering of the french trying to use c**** s*** as their national font but Copperplate Gothic Bold coming to the rescue and thwarting (entrevé’ing) a typical frenchman from succeeding. This artist rendering also correctly shows what happens to instances where c**** s*** is used inappropriately. A bald eagle majestically swoops down and carries the word done in the offending font away to be disposed of properly. So the moral of the story is don’t mess with Copperplate Gothic Bold and never ever ever ever ever ever use c**** s*** as a font, including you France! Otherwise a bald eagle will swoop down and get rid of your nonsense.